A paper led by ANU researcher Associate Professor Ray Lovett published in the journal Public Health Research & Practice today found a substantial drop in smoking among Aboriginal and Torres Strait Islander people over the last ten years. The research highlights the positive downward trends in daily smoking prevalence for young Indigenous people and Indigenous people living in urban areas. The majority of Aboriginal and Torres Strait Islander adults (around six in ten) do not smoke daily. According to the study, the proportion of Indigenous people smoking daily dropped by 9%, from 50% in 2004 to 41% in 2014. Lovett explains, ‘As a result, there are 35,000 fewer daily smokers today than there would have been if things had stayed the same since 2004. This will lead to thousands of lives saved’. ‘The way we communicate statistics matters. In our work we focus on the progress made within the Aboriginal and Torres Strait Islander population, and we find that substantial progress has been achieved. In contrast, when reports focus on the gap in smoking prevalence compared to the total Australian population, this can have negative consequences and can actually contribute to widening the gap’, said Lovett. The team used data from national surveys conducted by the Australian Bureau of Statistics to assess trends in Indigenous smoking over time. Dr Lovett and his research team are now working with two Aboriginal organisations, Central Australian Aboriginal Congress and Institute for Urban Indigenous Health, to better understand how their work contributes to the decline in smoking rates. The prevalence of daily smoking among Aboriginal and Torres Strait Islander adults in Australia has decreased by 8.6 percentage points (95% CI 5.5, 11.8), from 50.0% in 2004–05 to 41.4% in 2014–15. This corresponds to an estimated 35 000 fewer Aboriginal and Torres Strait Islander adult daily smokers in 2014–15, compared with if the smoking prevalence had remained stable since 2004–05. Our findings indicate that thousands of premature deaths in Aboriginal and Torres Strait Islander people have been prevented by the reduction in daily smoking prevalence over the past decade. Accurately determining the number of deaths averted requires additional data, such as cause-specific mortality. Declines in daily smoking among Aboriginal and Torres Strait Islander people were observed among both males and females, and were most evident among those aged 18–44 years, and those living in urban/regional areas. The absolute decrease in smoking prevalence observed in the Aboriginal and Torres Strait Islander population is comparable with the decrease of 6.8 percentage points (95% CI 5.6, 7.9) in the total Australian population over the same period, although the base smoking prevalence was substantially lower in the total Australian population (21.3% in 2004–05). These results demonstrate that considerable progress has been made in the Aboriginal and Torres Strait Islander population in the past decade, matching in absolute terms the extent of progress made in the total Australian population. 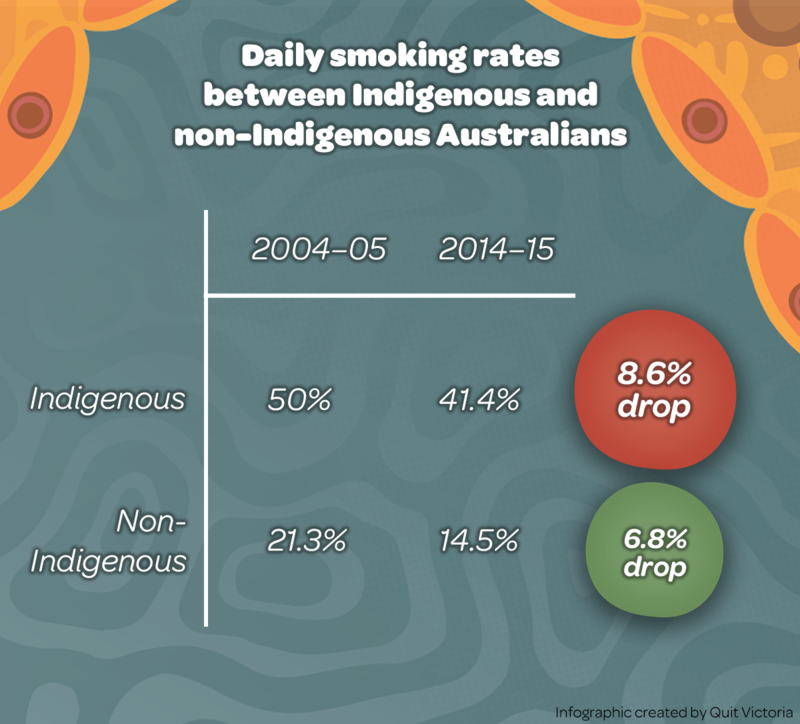 Given the similar absolute decrease in smoking prevalence in the Aboriginal and Torres Strait Islander and total Australian population, the gap in smoking prevalence has remained relatively stable. 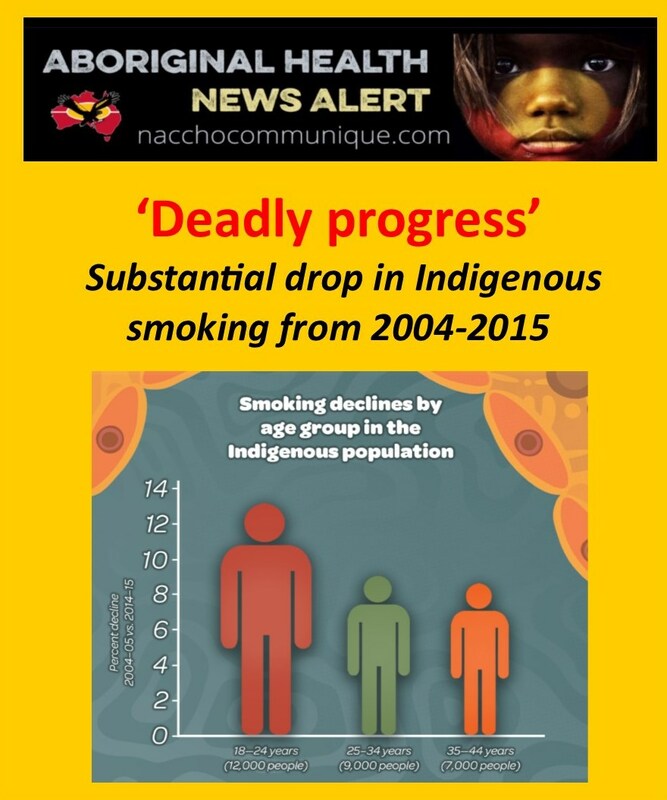 This may appear inconsistent with the Australian Institute for Health and Welfare’s midterm report for the National Tobacco Strategy 2012–20185, which reported that the gap in smoking between Aboriginal and Torres Strait Islander people and non-Indigenous Australians had increased between 2008 and 2015. Focusing on relative differences in isolation can obscure progress at the population level; that is, the absolute number of Aboriginal and Torres Strait Islander adults quitting or not taking up smoking. Further, research from other populations demonstrates that communicating information about health inequity using a progress frame (as used in this paper) rather than a disparity frame (i.e. focusing on the persisting gap) is associated with more positive emotional responses and increased interest in engaging in health-promoting behaviours.14 Therefore, we consider it ethical to report absolute progress in smoking prevalence. The ambitious target to halve Aboriginal and Torres Strait Islander adult daily smoking prevalence to 23.9% by 20186 will not be achieved if current trends continue. However, this target would be reached within the next two decades if smoking prevalence continues to decrease at the current rate. If the success in smoking reduction observed within the younger age groups and those living in urban/regional areas is echoed in older age groups and in remote areas, this target may be reached earlier. We observed significant reductions (about 10%) in daily smoking prevalence among the youngest age groups (18–24, 25–34 and 35–44 years). Data from the 2004–05 NATSIHS indicates that two-thirds of current and past Aboriginal and Torres Strait Islander smokers had begun smoking by age 1817; therefore, our findings of reduced smoking prevalence among younger adults is promising. We observed reductions in daily smoking prevalence among male and female Aboriginal and Torres Strait Islander adults living in urban/regional areas. Given that the majority of Aboriginal and Torres Strait Islander people live in urban/regional settings, this is another encouraging finding at the population level. We did not detect a significant change between 2004–05 and 2014–15 in daily smoking prevalence among Aboriginal and Torres Strait Islander adults living in remote areas. The observed stability of smoking prevalence in remote areas from 2004 to 2015 is consistent with trends from 1994 to 2004.7 Despite being the largest available datasets, the number of survey participants in remote areas was relatively small, and is likely to be insufficient to detect changes in prevalence. The prevalence of smoking is reduced by increased numbers of people quitting and not taking up smoking. 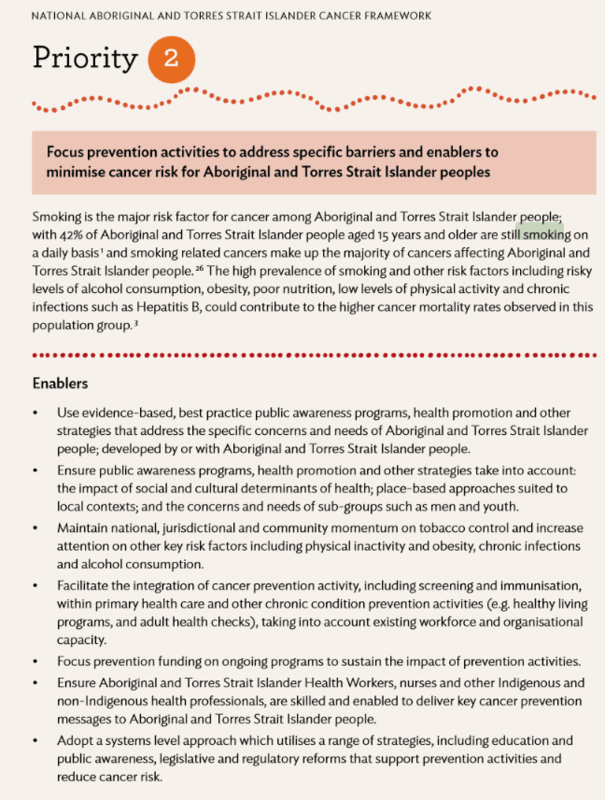 Since 2008, there has been a concerted effort in public health strategies, policies and programs to reduce tobacco smoking in Aboriginal and Torres Strait Islander people. Australia’s approach to tobacco control is comprehensive, and it is difficult to attribute changes to one program; however, continuing support for both whole-of-population and targeted strategies is required. We have restricted our analysis to current daily smoking – rather than including weekly or less frequent smoking – to enable consistent measurement across surveys, and to enable direct comparison with national tobacco targets.5,6 It is important to note that our analysis focused on cigarette smoking. Recent ABS surveys provide data on the use of other tobacco products (e.g. chewing tobacco); data on e-cigarette use are not yet available. Although we include a comparison with daily smoking prevalence in the total Australian population as a benchmark, this article focuses on variation in daily current smoking trends within the Aboriginal and Torres Strait Islander population. We have presented comparable estimates for the total Australian population, rather than the non-Indigenous Australian population, because of the data that were available, and we may therefore underestimate the gap in prevalence between the Aboriginal and Torres Strait Islander and non-Indigenous populations. However, this underestimation is likely to be very small; for example, in 2014, the difference between daily adult smoking prevalence in the non-Indigenous population (14.2%; 95% CI 13.4, 15.0)3 versus the total Australian population (14.5%; 95% CI 13.6, 15.4) was marginal. Applying a progress frame rather than a disparity frame and reporting absolute changes in smoking prevalence provides clear evidence of the substantial and significant declines in daily smoking prevalence among Aboriginal and Torres Strait Islander adults, which will result in considerable health gain. Particular success has occurred among younger adults and those living in urban/regional areas. Despite this progress, the smoking prevalence in the Aboriginal and Torres Strait Islander population remains high, with an estimated 165 000 current adult daily smokers. It will be critical to learn from the success among younger adults and those in urban areas to effect change among older age groups and those in remote areas. Continuation and enhancement of a suite of tobacco control efforts are required. ” The progress being made is heartening and exciting because it will have a lasting impact, taking us several great strides towards a healthier future. In the last few years as we all know, we’ve seen changes of prime ministers, we’ve seen changes of Indigenous affairs ministers, so all the advancement gets retarded in some way — the impact is lost. That’s what the Close the Gap 10-year anniversary was about: we now need to get governments to recommit to working together [with the opposition], to having a strong policy focus. Indigenous men have a life expectancy of 69.1 years, which is nearly 10 years less than for non-Indigenous men, while Indigenous women are also living almost 10 years less than other Australian women. It has to be a generational target, a 25-year target, because that’s how long it takes. I’m proud that more than 40 organisations, including many community-controlled Aboriginal health organisations, were monitoring the Close the Gap targets. Professor Tom Calma AO is Chancellor of the University of Canberra, Adjunct Professor at the University of Queensland, Adjunct Associate Professor at the Australian National University, Professor and Chair of the Poche Indigenous Health Network at the University of Sydney Medical School and National Coordinator, Tackling Indigenous Smoking. He is an Aboriginal elder of the Kungarakan people and a member of the Iwaidja tribal group and was ACT Australian of the Year in 2013. As his wife Heather says, “Tom works more than full time”. Along the fences, which back onto Mt Arawang, are rows of fruit trees, espaliered and cordoned at 45 degrees for extra space. There are three pear trees, four apples planted two years ago after landscaping work, a double-grafted apricot, a triple-grafted plum, two nectarines, two peaches,a cherry tree and a prune. However, possums reduce the crops. His mother’s father, Dutch engineer and agriculturist Edwin Verburg, was a pioneer horticulturist in the Northern Territory. He married Tom’s grandmother, Anmilil, a Traditional Owner of Adelaide River and the region 100 kilometres south of Darwin where he established a farm. In the 1920s he had fields of rice and maize, vegetables and tropical fruit where he introduced irrigation and built the first dam with centrifugal pumps. A bridge in the town is named after him. Tom’s father was also interested in horticulture and his first job was growing tobacco in the Darwin Botanical Gardens. My introduction to the Calmas was through Adrian Van Leest, of Campbell, a grower of family heritage tomatoes and a keen gardener. Heather Calma says that through Adrian, one year Tom grew a variety of potatoes called ‘Heather’ which had a purple skin. This year, however, their busy life meant Tom missed the potato planting season. The Chapman greenhouse is crowded with plants and horticultural products. There is a stool and fan for comfort when Tom experiments with his favourite weekend activity, raising plants with Marcotting, or air-layering, a specialty. Tom finds growing capsicums in the greenhouse means he can use them as perennials, though they do not produce fruit in winter. This season he has bell capsicums and long capsicums, bush tomatoes, ginger, pots of chillies and Warrigal spinach. He also raises broccolini, a cross between broccoli and Chinese broccoli, a hybrid developed in 1993. Heather says Tom grows unusual things sometimes that she doesn’t want to eat. One edible, not often seen is Celtuce, an ancient Asian vegetable called “wosun” in China. It has a trunk like celery and leaves like lettuce and Tom purchased it off eBay. Among rows of Heather’s dark foliaged plants in the front garden is Tom’s potted Manzanillo olive tree. He salts the ripe (black) olives for 30 days, washes them in fresh water to reduce the salt, dry, then cover in olive oil with chilli, diced limes and homegrown purple hard neck garlic, which makes delicious snacks. On our visit Tom obligingly dug a root of horseradish, a heavy job as the ground was hard after two 37C days and no rain. He says most recipes for mashing horseradish are similar. He uses this link: simplyrecipes.com/recipes/how_to_prepare_horseradish. The grated plant oxidises and gets very hot so use vinegar to stabilise it. 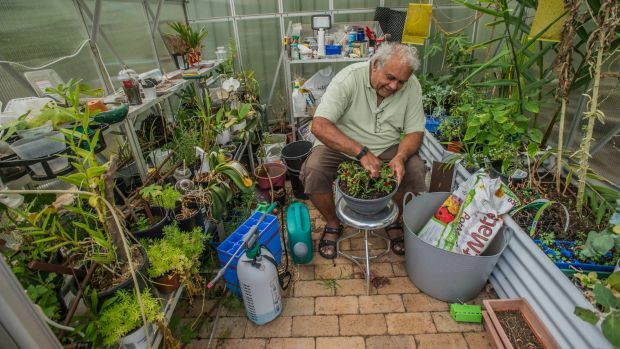 The couple met at university in 1977 and, for 14 years, lived in Darwin and in Humpty Doo with a large vegie garden. On diplomatic postings to India and Vietnam from 1995 to 2002, it was in India that Heather Calma started cooking and eating eggplants and it is one of her favourite edibles. Tom grows the long, slender Lebanese variety. When they lived in Darwin, Heather frequented a great Indonesian cafe at lunchtime and loved to eat their chilli bean dish. As they were leaving to move to Canberra, she cheekily asked how to make it and they shared the ingredients and basic method but not the quantities. Over the years she has turned this into a favourite chilli eggplant dish. Cut 10-12 Lebanese eggplants in half longways and microwave until almost cooked. Place them cut side up in a single layer in a large baking dish. Heat a dessertspoon of olive oil in a large fry pan. Once warm, add the mixture and cook on medium heat for four minutes, stirring occasionally. The mixture changes from salmon pink colour to a more orange colour when it has cooked enough. Gently bring to low simmer for a few minutes. Pour over the eggplant making sure all the eggplants are covered. Bake in a moderate oven for 30-40 minutes until the liquid has reduced and the dish browned slightly. Serve with rice and meat or chicken. Also delicious on its own. Susan Parsons is a Canberra writer. ” I want to say some more about New Year Eve resolutions or pledges. Common among smokers around the world is the pledge they make to give up. This is great, but the common experience is that within a couple of months the pledge is put on the back burner and old habits re-emerge. Now is a good time to mount a campaign to talk to your constituents about the “give up the smokes pledge” and encourage them to call Quitline or visit their doctor to talk about developing a strategy and getting support to quit and stay quit. It would be great for colleagues to get on the Yarning Place and share successful strategies and to post success stories. We might even want to host a pledge board and to monitor people’s pledges in three and six months’ time. Professor Tom Calma, National Coordinator for Tackling Indigenous Smoking, in his final Monthly Message of the year : Included in the National Best Practice Unit for Tackling Indigenous Smoking Update of the 12 December 2016 see below , is urging all Aboriginal organisations to take control and resolve in 2017 to implement smoke free workplaces. · Your Aboriginal Community Controlled Health Organisation and /or Tackling Indigenous Smoking regional team can provide you with smoking cessation support. Tackling smoking in the workplace is often put in the ‘too hard basket’. In 2016 this is no longer excusable. If we want to make significant inroads into tackling our smoking rates, we must have the courage and will to take control of our workplaces and have Board members, CEOs and Managers and staff step up and set an example to their communities. Our mob have the right to work in a smoke free environment just like everyone else in this country. On the 30 November this year, the Commonwealth Department of Health celebrated 30 years of being smoke free. Think of the benefits to all those working in this Department over these three decades. Health lead the way in the Commonwealth, with all other Departments becoming smoke free by 1988. Public and private sector offices implemented their own smoke free policies in the mid-1990s. Why is it that Aboriginal and Torres Strait Islander organisations, corporations and workplaces are either not smoke free, or do not enforce smoke free policies? The Smoke Free Workplace Policy currently operating in the Department bans smoking and use of e-cigarettes/personal vaporisers within 15 metres of all health buildings at all time. There may be elements of this Policy that you can draw on, including ideas on the assistance available to staff to quit. 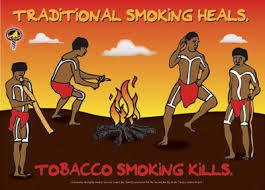 So when you work with or interact with an Aboriginal and Torres Strait Islander organisation or group encourage them to develop a smoke free policy and give them some guidance on how to do it. 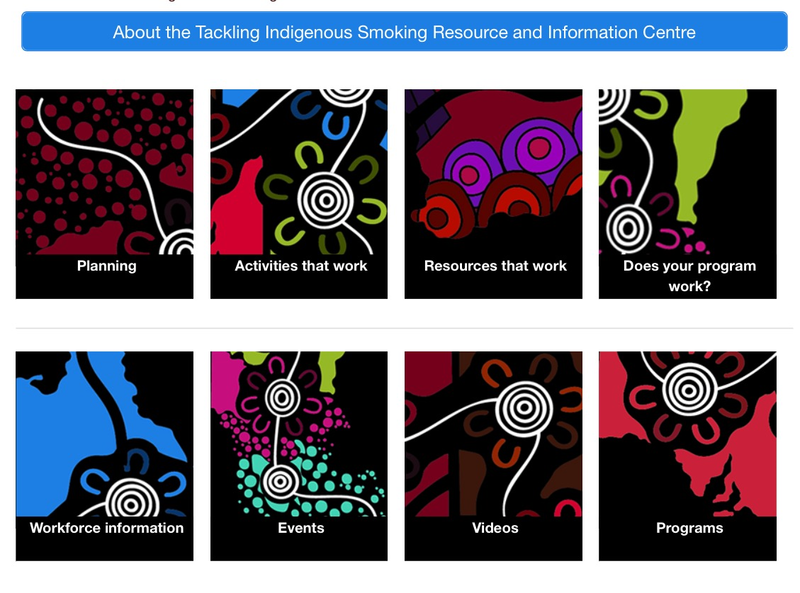 The TIS Portal includes resources on smoke free spaces: http://www.aodknowledgecentre.net.au/aodkc/aodkc-tobacco/tackling-indigenous-smoking/resources-that-work/tools-and-resources-to-support-activities-that-work. I encourage you to engage with colleagues on the Yarning Place to share strategies and ideas for smoke free workplace success. The 30 November was also the fourth anniversary of commencement of Australia’s world-leading tobacco plain packaging measures. If we can be world leading on tobacco control for all Australians, we can become leaders in Indigenous tobacco control to save our people, our culture and our languages. As this is my last message for 2016 I would urge you to place at the top of your New Year resolutions list adopting and enforcing smoke free workplace policies in your organisation and encouraging and helping our Aboriginal and Torres Strait Islander organisations to also realise these goals. I want to say some more about New Year Eve resolutions or pledges. Common among smokers around the world is the pledge they make to give up. This is great, but the common experience is that within a couple of months the pledge is put on the back burner and old habits re-emerge. Now is a good time to mount a campaign to talk to your constituents about the “give up the smokes pledge” and encourage them to call Quitline or visit their doctor to talk about developing a strategy and getting support to quit and stay quit. It would be great for colleagues to get on the Yarning Place and share successful strategies and to post success stories. We might even want to host a pledge board and to monitor people’s pledges in three and six months’ time. ” The many years of community-generated work in suicide prevention is something that Indigenous Australia, as a collective, should take great pride in. However, we have to acknowledge also that this alone has not been enough to stop Indigenous suicide rates overall getting higher recently, and that some communities remain at particularly high risk. After almost two years of work, ATSISPEP released a final report in Canberra on the 10th of November 2016. 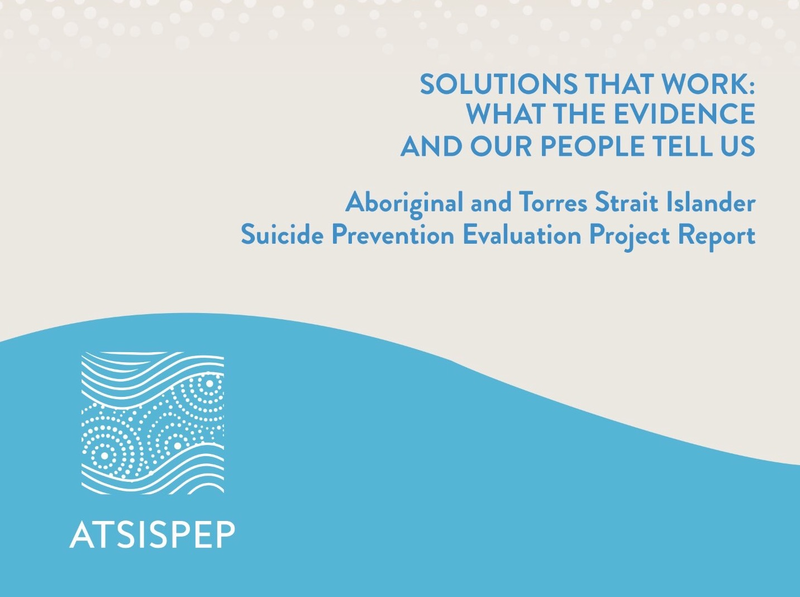 The Aboriginal and Torres Strait Islander Suicide Prevention Evaluation Project (ATSISPEP) is a unique Indigenous-led research project to identify ‘what works’ to prevent suicide in our communities. At launch at Parliament House with politicians from all parties and special guests the family of Norma from Leonora who lost a son not long ago and Lena from Fitzroy Crossings who lost a daughter. Our rates of suicide today are twice as high as other Australians and probably growing. Like the tip of an iceberg, high rates of suicide in a community can be a sign of deeper and complex community-wide problems, involving families and people caught in cycles of despair and a sense of hopelessness. Yet not all our communities, even those facing similar challenges, experience the same rates of suicide. ATSISPEP was developed with the recognition that for many years Indigenous Elders, community leaders and healers in some of our worst-affected communities have been working tirelessly to prevent suicide. Often volunteering, and with little or no financial support, they have generated community-specific and culturally-based ways of bringing people back from the edge of suicide and also supporting families who are bereaved by loss. In some cases, they have worked with entire communities to address the underlying community-level issues that can contribute to a suicide, for example, unemployment, violence, and alcohol and drug use. In others, they have connected young people to their Indigenous identity and culture and the sense of worth this can bring. Some good examples are presented in the Elders’ Report into Preventing Indigenous Self-harm & Youth Suicide (see: https://bepartofthehealing.org/EldersReport.pdf). The many years of community-generated work in suicide prevention is something that Indigenous Australia, as a collective, should take great pride in. ATSISPEP’s first challenge was to identify ‘what works:’ the success factors evident from the suicide prevention work already undertaken in our communities. The second challenge was to support the dissemination of ‘what works’ across all communities: to share knowledge, and ensure that all can benefit from this collective wisdom and experience. The report includes an analysis of Indigenous suicide prevention program evaluations and previous research and consultations on Indigenous suicide prevention. It includes the input of ATSISPEP-held regional community roundtables, and roundtables on specific topics (for example, on Indigenous young people and suicide prevention, justice issues, and Indigenous LGBTQI and suicide prevention). ATSISPEP also held a national conference in Alice Springs this May. It was an opportunity to test our work and gather even more information from the 370 attendees, most of whom were Indigenous. Community-specific programs to address the community-level contributing factors that can lead to suicide. Community development and ownership of programs. Access to culturally competent counsellors and mental health support for people at immediate risk of suicide. The involvement of Elders in programs. Cultural frameworks for programs, and cultural elements in them: for example, culturally-informed healing practices and connecting young people to country. Alcohol and drug use-reduction as a part of an overall response. Gatekeeper training, whereby community members are trained to identify people at risk of suicide and connect them to help. For young people, peer to peer mentoring, and education and leadership on suicide prevention. 24-hour, seven-day a week availability of support. 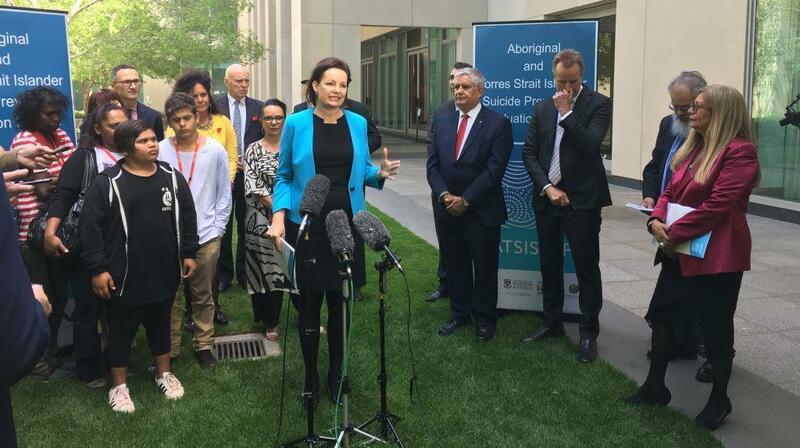 With ATSISPEP complete, the implementation of the 2013 National Aboriginal and Torres Strait Islander Suicide Prevention Strategy (with almost $18 million pledged to it) through the Primary Health Networks, and the establishment of at least two Indigenous suicide prevention trial sites (that were recently announced by the Australian Government) can proceed on an evidence-based footing. ATSISPEP has also generated tools for both Indigenous communities and Primary Health Networks to use to develop and strengthen programs. The hope of ATSISPEP is that its report will help bring about a new era in Indigenous suicide prevention in which many lives will be saved. It is now incumbent on Australian governments to ensure that our communities receive the support they need to help make this happen. All of the ATSISPEP reports can be accessed at www.atsispep.sis.uwa.edu.au. ATSISPEP was funded by the Commonwealth Department of Health. A community’s journey to find an answer to suicide: Photo: Helen Peterson, Elizabeth Taylor and Evelyn Peterson. Elizabeth Taylor, who lost her teenage friend to suicide, said the whole town was hurting. “Everyone here in Leonora is like family — we all know each other — so when somebody takes their life it hurts everyone,” Ms Taylor said. But Leonora is determined to face its grief. The town of Leonora, in Western Australia’s northern Goldfields is searching for answers after a spate of suicides. Four young people from the community have taken their own lives since Christmas — all of them Aboriginal. The inaugural Aboriginal and Torres Strait Islander Suicide Prevention Conference will be held in Alice Springs this week, and is expected to feature discussions about strengths-based, community-driven solutions. 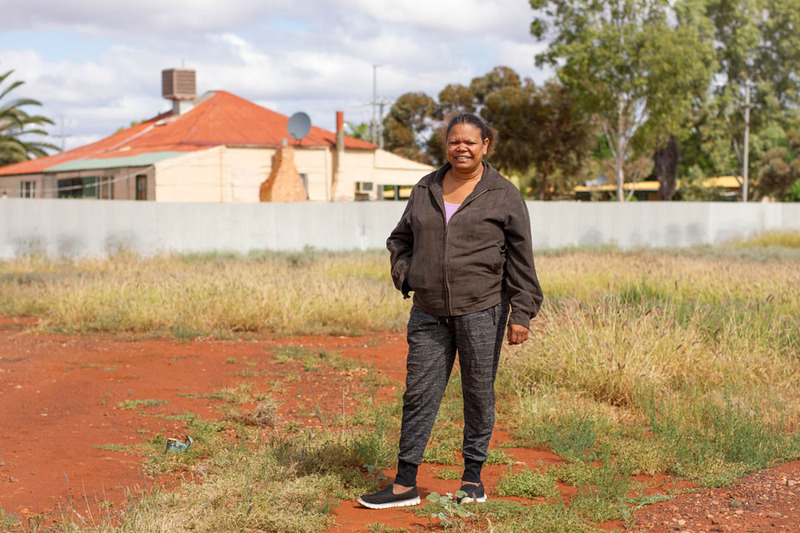 The conference will also hear of the importance of collective healing and secure funding arrangements, according to Summer May Finlay, a Yorta Yorta woman, Croakey contributor and PhD candidate. Our Aboriginal and Torres Strait Islander communities are strong and proud. Yet there probably isn’t an Aboriginal and Torres Strait Islander family who hasn’t in some way been touched by suicide or self-harm. An individual’s social and emotional well-being is closely strongly influenced by and connected to their family and communities’ well-being as well as a strong connection to culture and country. As well, social determinants that negatively effect people include poverty, unemployment, lack of housing, lack of access to appropriate services and ongoing racism. These make significant contribution to a sense of helplessness, hopelessness and despair for some people and can result in destructive behaviours. This is why the Inaugural National Aboriginal and Torres Strait Islander Suicide Prevention Conference is bringing together people, particularly Aboriginal and Torres Strait Islander people, to discuss not only the appallingly high rates of suicide seen in Aboriginal and Torres Strait Islander statistics, but also how to work towards a healthy future for individuals, families and communities. There has been much in the media recently about Aboriginal and Torres Strait Islander people and suicide. There was considerable information about the statistics, how terrible they are and the need to address the issue some how. There were many individual’s commentaries about what could be possible solutions. What the conference aims to do is to bring together people who work in the space at a local level, experts and community to yarn about community-based solutions and the community supports which are required to develop and implement them. There cannot be one-size fits all approaches. There are no quick fixes. There are no solutions that can achieve the unachievable in a political cycle. Over 200 years of colonisation, dispossession, racism, discrimination and marginalisation have taken a toll on our communities. No one knows these impacts better than Aboriginal and Torres Strait Islander people themselves; therefore Aboriginal and Torres Strait Islander-driven solutions are required. The conference will be held on May 5-6 at the Alice Springs Conference Centre. Keynote speakers are Aboriginal and Torres Strait Islander people including Stan Grant and Rosalie Kunoth- Monks. Other significant speakers include Professor Tom Calma, Co-Chair of the Aboriginal and Torres Strait Islander Mental Health and Suicide Prevention Advisory Group, Professor Pat Dudgeon, Project Director, Aboriginal and Torres Strait Islander Suicide Evaluation Project (ATSISPEP) and Richard Weston, CEO of the Healing Foundation. The conference organisers also recognised that we could learn from the experiences of Indigenous people from other countries and have included international representation in the program. Professor Tom Calma AO, former Social Justice Commissioner, believes that the conference is significant because it prioritises Aboriginal and Torres Strait Islander peoples’ perspectives. “The real significance is that this the first National Aboriginal and Torres Strait Islander Suicide Prevention Conference is that has been organised by us, with most of the speakers and workshops delivered by our people, and the majority of the participants are Aboriginal and Torres Strait Islander people,” he said. Vicki O’Donnell, CEO of the Kimberley Aboriginal Health Services Ltd, is a member of the Conference Advisory Committee, and believes the significance of the conference is the strengths-based approach. “We want to focus on interventions which promote cultural continuity, identity and language. We see these as protective factors. Part of that is building resilient, long-lasting programs,” Ms O’Donnell says. Professor Calma agrees that a strengths-based approach is one of the key aspects of the conference, which is why there will be a focus on learning from the experiences of Aboriginal and Torres Strait Islander people. Ms O’Donnell agrees that the priority is hearing from people who are working in the space or have lived experience. She expects the conference will also profile the importance of collective healing, believing that we need to come together as a collective of Aboriginal and Torres Strait Islander peoples across the country to learn from and support each other. “For non-Aboriginal people, I would like for them to become more aware of the underlying issues [of suicide and self harm]. “We want to recognise the people who are doing great work, and there are some fantastic groups at the local level who are building peoples awareness and resilience. The participants are from all over the country and… through our bursary program, we were able to make sure that a variety of people from across the country are represented. One could be forgiven for thinking that the conference will be all serious; however, if there is one thing we are good at as Aboriginal and Torres Strait Islander people, it is being able to laugh together, even when things aren’t so great. Conference organisers recognise that the conversations may be difficult for some people, and have ensured there are Aboriginal and Torres Strait Islander mental health professionals and psychologists to speak to conference attendees. Three counsellors at the conference will be from the Kimberley Aboriginal Health Services Ltd.
For those of you on social media – we encourage people to tweet, the hashtag is #ATSISPEP. Please keep in mind when engaging with social media that suicide and self-harm are sensitive issues. Below are some tips on how to engage with social media and the sensitive issue of self-harm and suicide. • Please do not record, stream or post video of people’s presentations without their express permission. • Please don’t post tweets with people’s personal stories or photos without their permission. • We encourage social media posts, which are strengths-based and solutions-focused in keeping with the conference tone. • We encourage healthy conversations; however, we know trolls do exist and recommend you ignore, report or block them if they engage in negative debate. Of course, there will be some take-home messages for governments too. Elizabeth Taylor, who lost her teenage friend to suicide, said the whole town was hurting. “Everyone here in Leonora is like family — we all know each other — so when somebody takes their life it hurts everyone,” Ms Taylor said. About 20 residents from the town have set off on a one-week 3,600-kilometre road trip through the desert to attend Australia’s first-ever Aboriginal and Torres Strait Islander Suicide Prevention Conference in Alice Springs on May 5 and 6. The conference is focused on Aboriginal and Torres Strait Islander responses to suicide and self-harm. Presentations will come almost exclusively from Indigenous people. Karen Beasley is one of those going on the journey. “I’m hoping to learn from others and I am hoping to maybe help others,” she said. Ms Beasley lost her niece to suicide in January, just three months after she attempted to take her own life. “There is no support out there in our communities,” she said. “There are young people in the communities that you know well. Ms Beasley said finding out about the death of her niece “was like a big brick hitting [me] in the face”. Leonora Aboriginal elder Richard Evans is the driving force behind the trip to Alice Springs. He said the trip to the conference was equally as important as the event itself. “Most of our people… have never been out of Leonora, so I’m trying to take some people across [to] Alice Springs so that they can see outside of Leonora and see what other people are doing out there,” he said. Ngaanyatjarra elder Glen Cook will act as a cultural guide on the journey. The group will stop in other remote Aboriginal communities en route to Alice Springs, to see how they deal with issues such as suicide and self-harm. Mr Cook said it would be an eye-opening experience for the young people. “It will be an emotional journey because they are carrying a burden on their shoulder and it will bring a lot of memories of people that have passed away,” he said. “I hope that the young people … will bring a lot of good ideas back,” he said. Leonora local Evelyn Peterson, who lost a friend to suicide, said she wanted to learn how to spot the signs of someone who was suicidal. “Life is too short — especially for these young ones. That is what makes it harder; we didn’t know those young people were going through those things,” she said. Leonora Deputy Shire President Matt Taylor said he hoped the group would return with ideas on how to rebuild and prevent any more young lives from being lost. “Our community has been treading on eggshells. It has been very difficult to find a way forward,” Mr Taylor said. “The initiative, launched in 2010, has helped to reduce Indigenous smoking rates, that have been falling at a faster rate than was seen in the general population, and he expects the 2016 national census to confirm anecdotal expectations of more success. If we have consistent government policies instead of the ‘stop start’ (approach) we’ve seen, the vulnerability of funding, and the demoralising of the community….then we will see even faster gains,” he told Croakey. 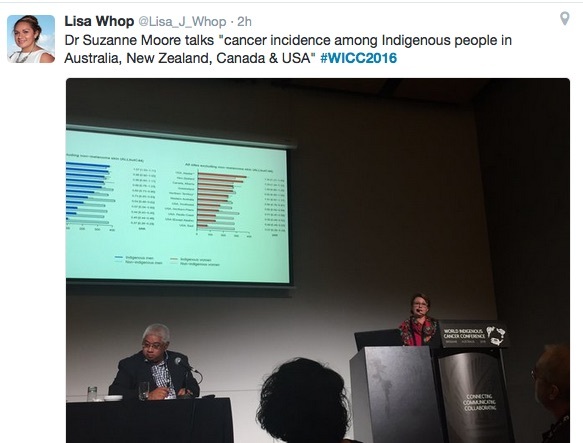 Around the world, diverse and innovative programs are tackling high smoking rates among Indigenous communities, according to presentations at the World Indigenous Cancer Conference in Brisbane last week. Some of these are big and nationwide like the Tackling Indigenous Smoking program led by Professor Tom Calma in Australia. Others are small, innovative and targeted, from efforts to “Keep it Sacred” among the Navajo tribes in the United States, through to a board game developed to help Maori Aunties to discourage smoking among young pregnant women. The conference also heard of the profound impacts of tobacco upon Indigenous communities. Lung cancer is one of the most common cancers in Indigenous populations, according to the first ever comparative population-based study of cancer incidence in Indigenous people in Australia, New Zealand, Canada, and the United States. Led by Australian researcher Dr Suzanne Moore, of the Menzies School of Health Research, it also found that smoking is more common in Indigenous communities in all four countries than in their non-Indigenous counterparts. Another key message from the conference was the impact of “stop start” government policies and a failure to address the social determinants of health that lead to high smoking rates in Indigenous communities. Harvard Public Health Professor David Williams, who presented a keynote address on the role of race and racism in health, said one important way to address tobacco-related cancers in Indigenous communities is to “address stressors in smokers that drive them to smoke”. It was also important to focus on the equity impact of anti-smoking policies, he said, where tobacco taxes have a bigger effect on poorer people. One media campaign that he said had worked better with minority young people in the United States focused on the deceptive practices of the tobacco industry rather than on the health impacts of smoking. Professor Tom Calma, Chancellor of the University of Canberra and a founder of the Close the Gap Campaign, is ever optimistic about the success of the Tackling Indigenous Smoking initiative, after the Federal Government last year committed funding and resources to a redesigned program. He told that conference that the initiative, launched in 2010, has helped to reduce Indigenous smoking rates, that have been falling at a faster rate than was seen in the general population, and he expects the 2016 national census to confirm anecdotal expectations of more success. Part of its power, he said, is to not focus on the perils of smoking – “that’s known” – but to talk about the benefits of non-smoking – “not blaming, but empowering”. It’s targeted big sporting activities, like the popular Murri Rugby League carnival, which is smoke and drink free and requires all players to complete a ‘Health Check’ in order to participate, the Nuff of the Puff program aimed at young people, and the successful Break the Chain promotion which is also being used in mainstream campaigns. But, he said, it had suffered from the “wax and wane” approach of governments – notably from a $30 million a year cut in funding under the Abbott Government and disruption of its work while a review of its operations was carried out by Assistant Health Minister Fiona Nash (see more detail in this previous Croakey story). That had created workforce instability in the Tackling Smoking and Healthy Lifestyle Teams across the country, and disrupted goodwill that had been built up in communities and organisations since 2010. As a result, he said, Australia is not going to meet its target of halving 2008 Indigenous smoking results by 2008. “We have to rebuild all that now,” he said. “If we have consistent government policies instead of the ‘stop start’ (approach) we’ve seen, the vulnerability of funding, and the demoralising of the community….then we will see even faster gains,” he told Croakey. 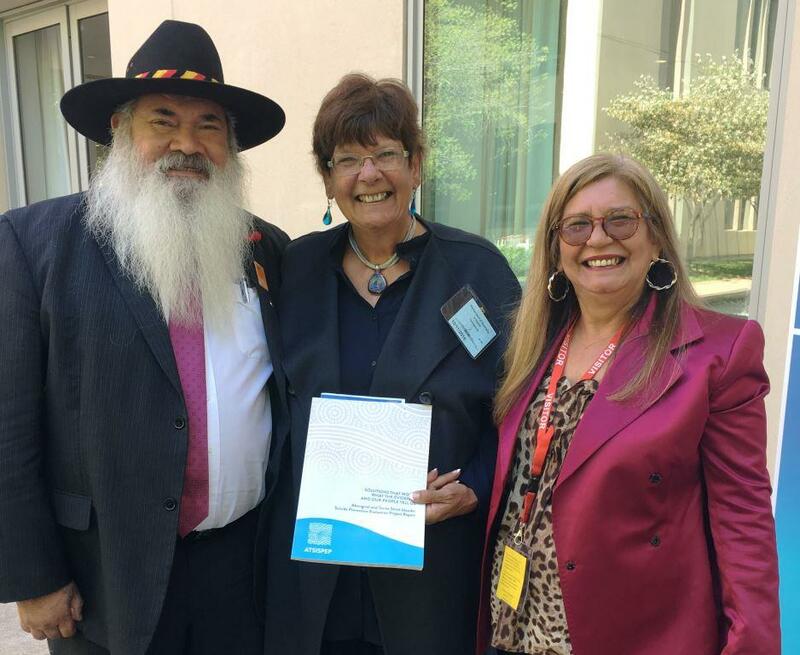 There’s hope that the new national Aboriginal and Torres Strait Islander Cancer Framework developed by Cancer Australia in partnership with Menzies School of Health Research will help to bring consistency and broader population based approaches. Calma said it’s an easy-to-read document that is the result of extensive consultation with the Indigenous community, and “that everybody needs to sign up to”. Prevention is Priority 2 – see the image below. Tobacco has been used by the Navajo, along with most other American Indian nations, for centuries as a medicine with cultural and spiritual importance, said Scott Leischow from the Mayo Clinic in the US. Traditionally the Navajo healers would go into the mountains and collect what they call ‘mountain smoke’ that grew naturally, to use in their ceremonies. But over the decades, he said, it’s become more common to just go to the local store and buy commercial tobacco instead, helping to further normalise the use of tobacco and continue to grow high rates of smoking. Leischow told Croakey the Mayo Clinic has been working to support tribal organisations that have started the “Keep it Sacred” movement to reduce commercial tobacco-related illnesses and cancer disparities among American Indian and Alaska Native populations. “So some of the tribal organisations are now working to create a policy within healing communities to only use mountain smoke,” he told Croakey. The Mayo Clinic has helped by making videos where healers talk about the role of commercial tobacco and how it has impacted on traditional ways, which will then be disseminated to schools and communities. Leischow is also working with tribal organisations that are trying to promote smokefree workplaces and public places. This is a complex and contentious policy area, he said, with many American Indian communities fearful that smoking bans in casinos, which have become an economic lifeline for many, will impact on business. (Check here to see success stories from Keep it Sacred). Conference keynote speaker Dr Linda Burhansstipanov, director of the Native American Cancer Research Corporation director, talked about another pilot intervention among around 250 Native Americans living in the Rosebud and Pine Ridge Indian reservations and Rapid City in South Dakota. One-quarter were cancer survivors, she said, in an area where the majority of people with tobacco-related cancer were back smoking within two years of ceasing treatment. The project used a combination of motivational support and nicotine replacement therapy (NRT). A big feature was that participants were given a mobile phone, so they could receive tailored text messages each day: a traditional Indian quote and/or personal messages such as: “I am quitting smoking so I can watch my granddaughter go through ceremony”. The cultural and ceremonial use of tobacco was an issue too with the community, although the novelty of the phones was a big one, with many participants having never had one before. In fact, Burhansstipanov said, some non-smokers had gone to the local casino, where smoking is permitted, to try to build up the carbon monoxide levels in their blood so they could qualify for the program. Others built up pretty high phone bills, just calling information lines. But, she said, “that’s why they call it research” and while results are still unofficial it is showing great promise. Burhansstipanov said the norm for stop smoking interventions was to get a quit attempt rate of about 7 per cent, and up to 12 per cent in very effective interventions. Burhansstipanov was speaking at an early morning symposium on traditional and innovative arts and media-based research to prevent smoking and cancer. The forum also heard about the ‘Talking about Smoking’ project among the Yolngu people of East Arnhem Land. You can read more and watch a video about it here. Researcher Moana Tane said the Yolngu were introduced to tobacco by Macassan traders and “traditional and culural factors have contributed to normalisation of smoking”. Narali (tobacco) is celebrated and viewed as an essential part of culture, although interestingly most in the community are happy to have smoke-free homes. There was a need to consider “very carefully” how to intervene, not wanting to offend and denigrate a cultural relationship built up over hundreds of years, but also to be confident offering support because it is what the community want. And then it was game time. 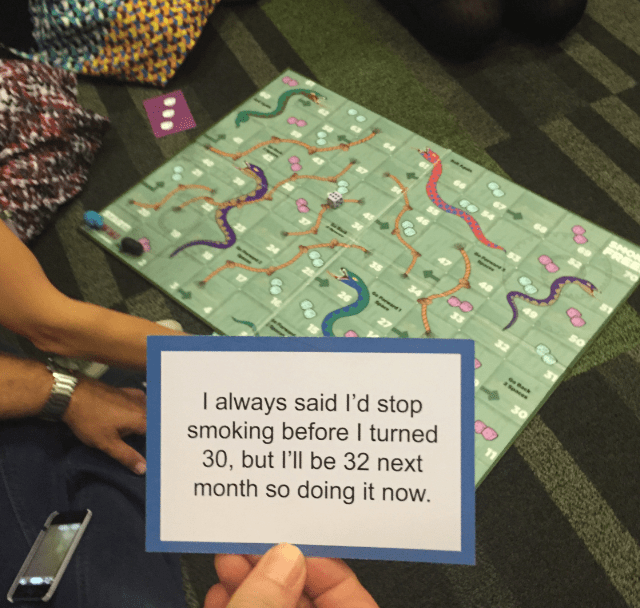 Maori Public Health Professor Marewa Glover explained she wanted to find a way for Aunties to support young pregnant Maori smokers to quit, so she developed a board game to help them deliver essential messages on smoking, nutrition and antenatal care. Like a Snakes and Ladders game, it’s based, she said, on Robert West’s theory of addiction, where quitting smoking is not a straightforward journey. It has ‘low dice’ cards to connect with low motivation days, and ‘high dice’ cards when smokers are more likely to listen to quit messages. The snakes represent relapse. “The Aunties were much more interested in playing a game than having me stand and lecture,” she said. • The feature image is from the Keep it Sacred website. 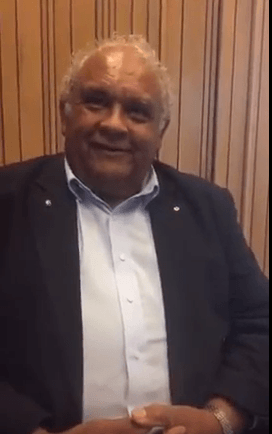 • Watch Professor Tom Calma talking about the harmful impacts of “stop start” government policies for the health of Aboriginal and Torres Strait Islander people. • Marie McInerney is covering #WICC2016 for the Croakey Conference News Service. Track the conference coverage here. 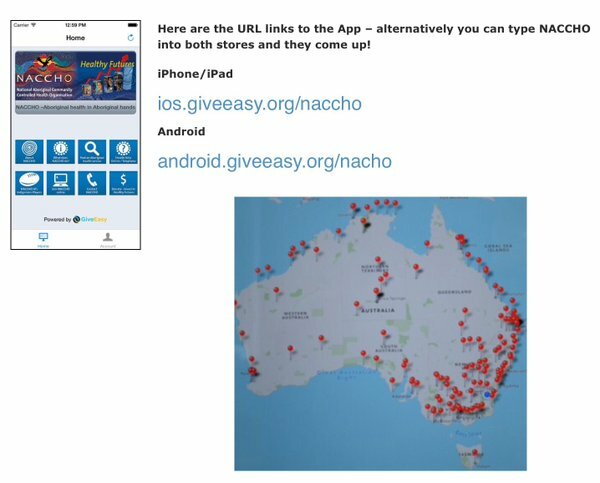 NACCHO #CTG10 News alerts :Why is it so hard to Close the Gap? Well, you know, I think it’s never acceptable if we don’t have a consistent policy approach and consistent funding and ministers who can stay focused and committed.The lack of progress should never be interpreted as a failure by Aboriginal and Torres Strait Islander people. It’s a failure of bureaucracy and a failure of the politicians to keep an even course and to keep the funding and the policy direction consistent. Prof. Tom Calma discussing where things have gone wrong (and occasionally right) in the attempt to close the gap between indigenous and white Australians. LEIGH SALES, PRESENTER: Tomorrow ( February 10) we will see the latest report card on the stark disparities between Indigenous lives versus those of other Australians. The Government will respond to the latest Closing the Gap report. Tony Abbott was the prime minister for the last one and he described it as “profoundly disappointing”. And while tomorrow’s report will show progress in some areas, overall it will paint a bleak picture. To discuss the issue I was joined a short time ago from Canberra by Professor Tom Calma, the chancellor of Canberra University and the co-chair of Reconciliation Australia; Dr Jackie Huggins, the co-chair of Australia’s National Congress of Australia’s First Peoples; and Luke Pearson, the founder of Indigenous X, a social media space drawing attention to all sorts of Indigenous issues. Professor Calma, Dr Huggins, Mr Pearson: thank you very much for joining us this evening. LUKE PEARSON, FOUNDER, @INDIGENOUSX: Thank you. JACKIE HUGGINS, DR., NATIONAL CONGRESS OF AUSTRALIA’S FIRST PEOPLES: Thank you, Leigh. TOM CALMA, PROF., CO-CHAIR RECONCILIATION AUSTRALIA: Thank you. LEIGH SALES: Professor Calma, is it too cynical to think that tomorrow we’re probably going to hear what we hear every time this report comes out, which is some talking up of small progress in some areas; but when the glaring disparities are pointed out, we’ll hear the old staple: that there’s still a lot of work to be done? TOM CALMA: Oh, look, but I think the reality is that there is still a lot of work to be done. You know, we’re talking about a generational target, a generational aspiration to be a able to close the inequality gap. And we’ve only been going for 10 years and whilst that seems like a long time on paper, you know, the real concern is that in that 10 years we’ve seen, really, the campaign kick off in 2008. So then you’re only looking at, you know, less than 10 years since the Closing the Gap campaign started by government and it is early days. And even though we’ve seen some progress, we’ve also seen massive changes within government and I can’t think that there’s one minister who is still in the Government who was involved with us at the beginning of this campaign. LEIGH SALES: Everyone would say, of course, it would be fantastic if the pace of change were faster, but do you think that the pace we’ve seen so far is realistic and therefore acceptable? TOM CALMA: Well, you know, I think it’s never acceptable if we don’t have a consistent policy approach and consistent funding and ministers who can stay focused and committed. The lack of progress should never be interpreted as a failure by Aboriginal and Torres Strait Islander people. It’s a failure of bureaucracy and a failure of the politicians to keep an even course and to keep the funding and the policy direction consistent. LEIGH SALES: Dr Huggins, what’s your take on some of the points that Professor Calma has raised there? Do you see a problem with a lack of consistency in the bureaucracy and in the political sphere? JACKIE HUGGINS: Yes, we do. From the National Congress of Australia’s First Peoples’ point of view, we do see that there is lack of engagement, not a general commitment to the needs and the aspirations of Aboriginal and Torres Strait Islander people in their community. And we believe that our country, our people are in deep, deep crisis in terms of Aboriginal and Torres Strait Islander policy in this country. For me: I’ve worked for many decades now and I can’t remember such a low point in our history where our people on the ground are just not getting the services. LEIGH SALES: And so where’s the bottleneck there? Like, why does that happen? JACKIE HUGGINS: Well, a lot gets wasted and a lot gets caught up in government and bureaucratic funding. And the programs that are not reaching our people on the ground are very important programs. And we’ve just seen recently with the cuts in our budgets and we hope that the next round of government policy in the budget does not cut our people further. But we know that’s probably not the reality, because there are going to be cuts right across the board. LEIGH SALES: Mr Pearson, what’s your take on what the other two speakers have had to say? LUKE PEARSON: Yeah, well, I’d agree, you know, with the most part. You know, when the failures in Closing the Gap come out and get announced, it’s quite often Aboriginal and Torres Strait Islander people who cop a lot of the brunt of the blame for what’s going on. But with the closing of services, with the lack of funding, with the big stick approach from Government usually being the mainstay, it’s not at our end where these things are falling over. And so I think, you know, the failure within Government here to meet their own targets is a great opportunity for us to actually sit back, acknowledge the failure, look for some of those reasons why and acknowledge the fact that, you know, we’re the only Commonwealth nation that doesn’t have a treaty. We also have the highest rates of Indigenous incarceration. We have off-the-charts numbers of Indigenous youth suicide. And I don’t think these things are unrelated. LEIGH SALES: With those issues: I mean, I could sit here and spend the whole rest of the interview just rattling off just shameful statistics in this area. Given the gap that there is in so many aspects of life between Indigenous and non-Indigenous Australians, why do you think, Mr Pearson, this isn’t an issue that’s just absolutely front-and-centre of the public debate in Australia every day? LUKE PEARSON: I think a big part of it is that, you know, from within Government, from within media, within mainstream Australian society, the big conversation that we don’t want to have is about Aboriginal empowerment and is about racism. And those two issues are conversations that we’re going to need to have and there’s going to be some very hard questions that need to be asked if we’re going to see progress around those points. And while we still look at, you know, “Aboriginal people can’t be trusted” to look after our own affairs and we have a preference to look at Government for solutions, rather than from communities, we’re going to keep moving backwards. LEIGH SALES: Professor Calma, Mr Pearson raised the idea of a treaty. What do you think about that? And what do you say to people who might say, “Oh well, that’s symbolic but it wouldn’t be a practical help”? TOM CALMA: Well, look, I think it’s very important because we’ve got to look – and this is what the Close the Gap campaign is all about – is looking holistically at the issue of health and looking at the determinants that impact on whether people enjoy good health or not. And that includes employment, education, social and emotional wellbeing, you know, our mental health status. All have to be looked at and addressed appropriately. And treaty is just one of those key issues that we need to consider. LEIGH SALES: Dr Huggins, let me take you back to a point that Luke Pearson raised about the type of conversation he thinks Australia needs to have about racism and empowerment. What’s your view about that? JACKIE HUGGINS: Yes. Look, I absolutely agree. In fact, as a historian myself I know that, you know, the true history of our country and the racism that has been permeated since is not taught. It’s not recognised and it’s not even believed sometimes, out there in the community. I think racism is at the very core of the systems that operate in this country. It goes to the heart and soul of our people in terms of trying to lead better, fulfilled and richer lives. And if white Australia can come to the proposition that, you know, we don’t want racism in our country; it’s not accepted and we should move on together as a nation; I’m sure that we would find in our hearts and in our minds that there is a possibility that we can work this thing together. Because as Stan Grant said in his speech recently, you know, we are better people than that. And certainly our people – Aboriginal and Torres Strait Islander people, the first nations people of this country: I believe and many other people do believe that we deserve much, much better. LEIGH SALES: Final question for you, Luke Pearson: what’s the one thing you’d like to hear Government say tomorrow when this report’s released? LUKE PEARSON: That they’re going to prioritise the voices of Indigenous people: not just a select few, but from the community; people who work in the sectors, from teachers, from doctors, from nurses, from the activists who are standing outside. There’s so much information out there and so many perspectives that are valuable and need to be respected if we’re going to be able to move forward together. LEIGH SALES: Thank you so much to all three of you for making time to speak to us tonight. Much appreciated. 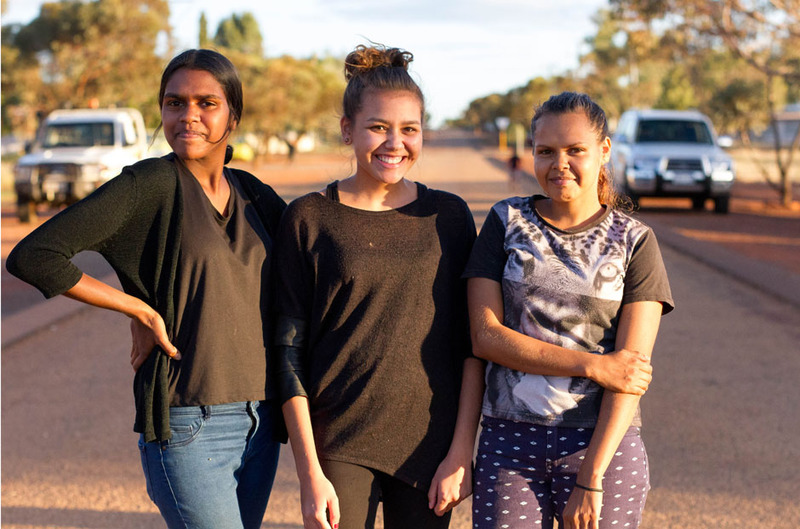 Will this be the generation to close the indigenous gap? At the heart of this nation, there is a fundamental wrong in the relationship between the First Peoples and non-indigenous people. We are divided between those who celebrate Australia Day without any thought of the implications of that day, and those who mourn Invasion Day and mark it as Survival Day, those for whom racism is an abstract noun, and those for whom racism is a concrete daily reality. There is yet another division. It’s the entrenched indigenous health crisis that separates those who can enjoy good health in their golden years from those who die 10 to 17 years younger. The denial of these basic human rights to equality and dignity were why we heard a rallying cry 10 years ago from the then Aboriginal and Torres Strait Islander social justice commissioner Tom Calma to achieve Aboriginal and Torres Strait Islander health equality within a generation. He said in 2005, when launching his Social Justice Report, that “it is not credible to suggest that one of the wealthiest nations in the world cannot solve a health crisis affecting less than 3 per cent of its citizens”. This call to action led to the establishment of the Close the Gap Campaign . Next month marks the 10-year anniversary of our campaign. Made up of more than 20 indigenous and non-indigenous organisations, and supported by more than 200,000 Australians, the goal is to achieve Aboriginal and Torres Strait Islander health equality by 2030. In other words, to “close the gap” within a generation. So what has been achieved in a decade? We had a major breakthrough in 2008 when all sides of politics came together to sign the Close the Gap Statement of Intent, a commitment by all governments through COAG to achieving Aboriginal and Torres Strait Islander health equality. This was followed by funding of $1.6 billion committed over four years to tackle the crisis. Since 2009, we have seen improvements in infant and child health outcomes, a gradual closing of the gap in smoking rates, significant increases to the number of health checks and increased access to medicines due to higher levels of resourcing to the Aboriginal and Torres Strait Islander health sector. But the long-term impact of such improvements on adult health and life expectancy is yet to be seen, with a life expectancy of 69.1 years for indigenous men being nearly 10 years lower than for non-indigenous men, and a life expectancy of 73.7 years for indigenous women being nearly 9.4 years lower than for non-indigenous women. We know that it takes time to design, deliver and evaluate health programs. Similarly, it will take time for health improvements to become evident. TS Eliot once said that “between the idea and the reality … falls the shadow”. For Aboriginal and Torres Strait Islander peoples, that shadow too often takes the form of a cloudy spot on an X-ray, a diabetes diagnosis or a disrespectful or racist encounter at a hospital reception desk. It is the shadow that falls between a handshake or the signing of a statement, and a budgeting decision by a treasurer. Closing the gap and moving out of the shadow require long-term, concerted efforts and respectful relationships between government and our people. It requires strong leadership from Aboriginal and Torres Strait Islander people, and buy-in from our communities. This has been exemplified by the nation’s high-level body for Aboriginal and Torres Strait Islander peak health organisations, the National Health Leadership Forum, which has pushed for action on health inequality and worked with government to guide future directions. Their hard work in partnership with the Australian government led to last year’s launch of the Implementation Plan for the National Aboriginal and Torres Strait Islander Health Plan (2013-2023). The implementation plan will reinvigorate efforts to close the health gap through identifying core service models and service gaps, workforce requirements and funding mechanisms, reducing racism and highlighting the importance of culture to improved health outcomes. But a plan without appropriate resourcing cannot address the appalling life expectancy gap. It is imperative the government provides appropriate funding for the implementation plan in the 2016 budget. Specifically, there needs to be an overall increase in resources directed towards Aboriginal and Torres Strait Islander health — in proportion to population size, service need and demand. This is vital, given the National Partnership Agreement on Closing the Gap in Indigenous Health Outcomes expired in 2014, and funding under that agreement has finished. What’s heartening is that Australians are, in ever-increasing numbers, demanding decisive action to support achieving Aboriginal and Torres Strait Islander health equality by 2030. It is clear this generation of Australians wants to see their governments make good on the commitments made back in 2008. Health inequality has been described as a stain on our nation. This generation knows it has the opportunity, and responsibility, to remove it. The message is clear. We must be the generation that closes the gap. Mick Gooda is the Aboriginal and Torres Strait Islander Social Justice Commissioner and co-chairman of the Close the Gap Campaign. Jackie Huggins is co-chairwoman of the National Congress of Australia’s First Peoples and co-chairwoman of the Close the Gap Campaign. “About 42 people cent of Aboriginal and Torres Strait Islander people are daily smokers – this is about three times the daily smoking rate for all Australian adults. Aboriginal people have a greater understanding of the risks of smoking following the introduction of plain packaging of tobacco in Australia, new research shows. Aboriginal and Torres Strait Islander people were surveyed before and after the introduction of plain packaging for the study, published in the Australian and New Zealand Journal of Public Health. The study found that Aboriginal and Torres Strait Islander people were less likely to incorrectly believe that “some cigarette brands are more harmful than others” following the introduction of plain packaging. In addition, fewer younger Aboriginal and Torres Strait Islander people (aged 18-29 years) believed that “some cigarette brands are more prestigious than others” following the change. As a result of new laws introduced on 1 December 2012, all tobacco products sold in Australia must be in plain packaging which does not feature brand imagery, logos or promotional text. The drab, standardised packaging also includes large and graphic health warnings. National Coordinator of the Tackling Indigenous Smoking program, Professor Tom Calma, said the findings showed that plain packaging was achieving its aims in Indigenous populations. “Too many of our people smoke and this is causing great harm in our communities,’’ Professor Calma said. “Smoking is the number one cause of preventable disease and death for Indigenous and non-Indigenous people in Australia. Study co-author Dr Sarah Durkin, of Cancer Council Victoria’s Centre for Behavioural Research in Cancer, said the findings were consistent with research across the Australian population showing that plain packs were diminishing the tobacco industry’s ability to use packs to mislead people about the harms of smoking. Quit Victoria Director Dr Sarah White said the high rate of smoking among Aboriginal people meant they carried a heavier burden of preventable death and disease, compared to the rest of the population. “Reducing the number of Aboriginal and Torres Strait Islander people who smoke is essential to prevent illness including cancer, heart disease and strokes,” Dr White said. Professor Calma said the Tackling Indigenous Smoking program was using innovative, culturally appropriate approaches to reduce smoking in Aboriginal and Torres Strait Islander communities. “With strong leadership and a comprehensive health workforce effort in partnership with Aboriginal and Torres Strait Islander people, we can halve the Indigenous smoking rate over the next decade and give our people the opportunity to live long and healthy lives,’’ he said. New research suggests that the 2012 introduction of plain packaging and larger pictorial health warnings on cigarette and tobacco packs is proving useful for Aboriginal and Torres Strait Islander people. 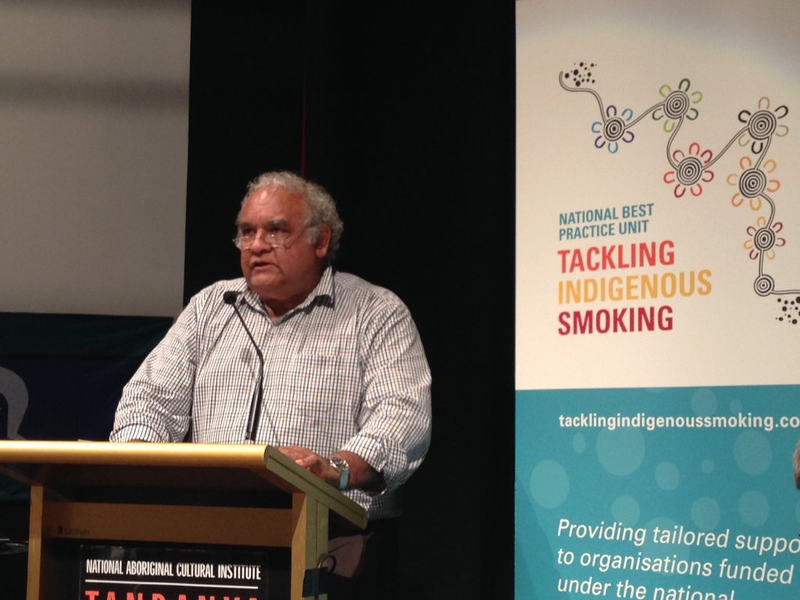 Professor Tom Calma AO, National Coordinator of the Tackling Indigenous Smoking project, provides an overview of the findings below, and cautions that more work is needed to reduce the toll of smoking among Aboriginal and Torres Strait Islander people. The study, Plain packaging implementation: perceptions of risk and prestige of cigarette brands among Aboriginal and Torres Strait Islander people, was published by Raglan Maddox, Sarah Durkin andRay Lovett in the latest edition of the Australian and New Zealand Journal of Public Health. The introduction of plain packaging and associated health warnings has been a success for Aboriginal and Torres Strait Islander people, new research suggests. Research involving Aboriginal and Torres Strait Islander people living in the ACT and surrounding areas found they were better informed about the risks of smoking as a result of the policy. Before its introduction, they were significantly more likely to mistakenly think that some brands of cigarettes were less harmful than others. In addition, after the introduction of plain packs, there was a decrease in the proportion of younger Aboriginal and Torres Strait Islander people indicating that ‘some cigarette brands are more prestigious than others’. The Tobacco Plain Packaging Act 2011 and Regulations 2011 prohibits brand imagery, logos, promotional text, and includes restrictions on colour, format, size and materials of packaging, as well as brand and variant names on tobacco products. Objectives of plain packaging are to reduce the ability of the retail packaging of tobacco products to mislead consumers about the harms of smoking; reduce the attractiveness and appeal of tobacco products to consumers, particularly young people; increase the noticeability and effectiveness of mandated health warnings; and through the achievement of these aims in the long term, as part of a comprehensive range of tobacco control measures, contribute to efforts to reduce smoking rates. The study’s findings provide important support for regulatory measures to prohibit the use of misleading package imagery in product marketing, as prescribed in Articles 11, 12 and 13 of the Framework Convention on Tobacco Control, as well as the key international and domestic leadership role of the Australian Government. However, more work is required. The Australian Government has an opportunity to continue, and to accelerate de-normalising tobacco use; addressing the cause of one in five of Aboriginal and Torres Strait Islander deaths, the estimated 15,000 Australian tobacco related deaths, and the $31.5 billion in tobacco related social and economic costs each year. In my role as National Coordinator – Tackling Indigenous Smoking, I am overseeing the Tackling Indigenous Smoking Programme to work with Aboriginal and Torres Strait Islander people and communities to reduce the number of people smoking and to encourage people not to take up smoking. 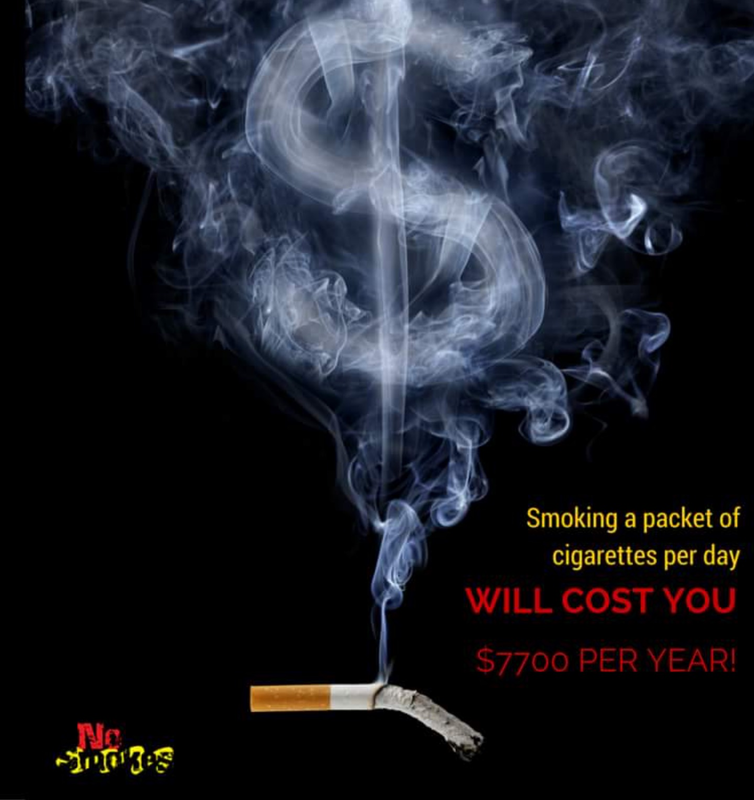 The Tackling Indigenous Smoking programme complements and leverages off tobacco control measures—such as plain packaging, increases in tax excise and smoke-free polices—by using innovative and culturally appropriate, community-based approaches to address uptake and smoking by Aboriginal and Torres Strait Islander people. In continuing to act locally, working nationally we should take the leadership role to improve, increase and establish national initiatives, such as improving accessibility to Nicotine Replacement Therapies (NRT), expanding smoke-free areas and establishing all prisons to be smoke-free across the country. Reducing the number of Aboriginal and Torres Strait Islander people who smoke is essential in realising the goal of closing the gap in health status equality and life expectancy. With strong leadership and by working with Aboriginal and Torres Strait Islander people themselves, we can halve the Indigenous smoking rate over the next decade and give Aboriginal and Torres Strait Islander people more opportunity to live long and healthy lives. It is fundamentally deceptive and misleading to allow a continuation in the perception that some cigarettes are less hazardous than others, including so-called ‘additive free’, ‘natural’ or ‘lower tar’ cigarettes, given that conventional cigarette brands present the same level of risk. Government agencies committed to tobacco control should investigate regulating the use of brand imagery, logos and promotional text on tobacco. For information on how to stop smoking, please call the Quitline on 13 78 48, visit www.icanquit.com.au or your local Aboriginal Medical Service, GP or medical practitioner. Money spent on jailing Indigenous Australians should be funnelled instead into community programs to stop them offending in the first place, a leading academic has said. Australian National University professor Tom Calma made his call after a report showed that Indigenous offenders with mental illness were over-represented in the New South Wales prison system. The report, authored by the University of NSW, found that one quarter of the 2,700 prisoners in NSW who had a known mental illness or cognitive disability were Indigenous, despite making up less than 3% of the state’s overall population. Calma, the adjunct professor of the ANU’s centre for Indigenous studies, said the incarceration rate for Aboriginal and Torres Strait islanders with mental illness was deeply concerning. State and commonwealth governments must take a “community empowerment” approach via justice reinvestment programs, he said. The initiative redirects money that is being used to lock up prisoners to community programs that treat the underlying cause of offending. Calma told Guardian Australia that the initiatives have a proven track record. The programs have also been successful in the NSW towns of Bourke and Cowra. He said that too often mental illness and cognitive disability in Indigenous people goes undiagnosed and untreated, which can lead to incarceration rather than appropriate treatment and intervention. “We need to look at what is the catalyst for the mental health issues,” he said. The University of NSW report highlights some of the underlying causes or exacerbators of mental illness for Indigenous Australians. Those include the prevalence of foetal alcohol spectrum disorder (Fas-D), drug and alcohol abuse, exposure to trauma and high rates of poverty and homelessness, which may prohibit seeking treatment. The report also noted that Aboriginal and Torres Strait islanders have contact with law enforcement authorities at a younger age, making them more susceptible to serving jail time. Of the nearly 33,800 prisoners in Australia, 27% – or 9,200 – are Indigenous, the Australian Bureau of Statistics has found.